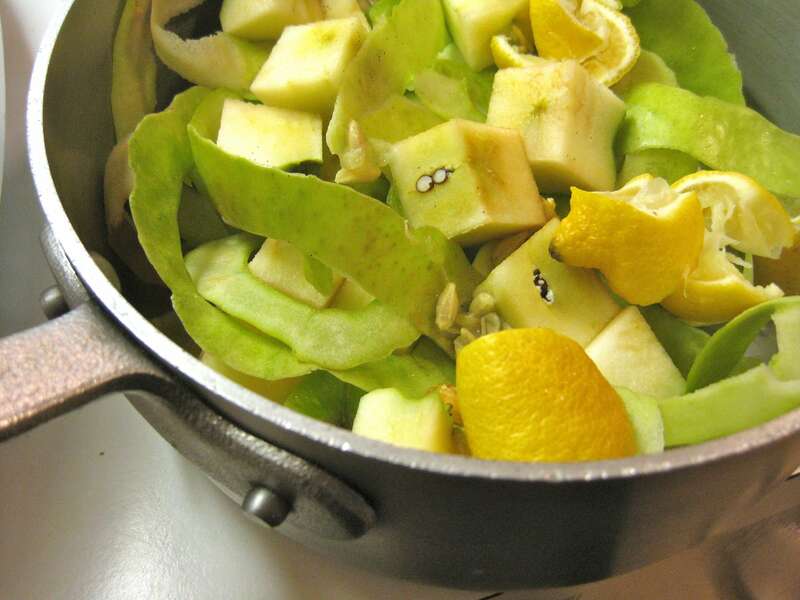 After peeling and coring eight organically grown apples for a Thanksgiving pie and sprinkling the slices with the juice of a fresh lemon to keep them from browning, I had a pile of leftovers that could have gone into the garbage can or the compost heap, but why? They make the perfect combination for jelly. 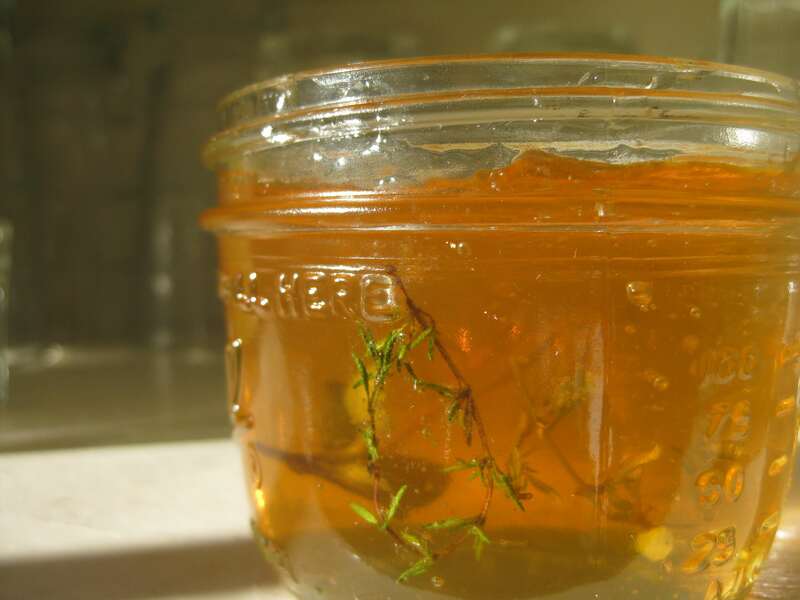 Natural pectin is developed from the peels and seeds of both apples and lemons, so I simply covered them with water, simmered them with herbs until soft and drained the liquid in a jelly bag overnight. I used sage, rosemary and thyme as the flavoring but alternatively I could have used the peelings and scraps of fresh ginger, which I’ll do next time. With added sugar, and 5 minutes of boiling the next day, we had a gorgeous, aromatic and very tasty jelly for our morning biscuits (or in the case of the ginger, we would have a glaze for a fruit tart). People often ask me how I have time to preserve so much stuff for my pantry. The simple answer is that once you’re comfortable with the technique, this type of jelly takes no time or focus. It took me longer to post this than to make it, but each under 15 minutes and while I was doing other things. Like toasting my homemade gluten- and dairy-free cornbread for stuffing, making turkey stock, baking pumpkin and apple pies, and otherwise preparing for the big feast. I didn’t can this jar, which would have added 10-15 minutes’ more effort, but I am giving you the directions to do so. Put the apple and lemon trimmings and the herbs or ginger in a large soup pot and barely cover with water. Bring water to a boil, reduce to a simmer and cook, covered, for 30-45 minutes or until very soft. Pour into a jelly bag suspended over a bowl (or a sieve lined with cheesecloth) and let the mixture drain a minimum of two hours or overnight. If you are going to preserve the jelly via water bath canning, prepared the jars and lids. Place a saucer in the freezer before you start so that you have a cold surface to gauge the gel. Measure the strained juice and for every cup, add ¾ cup of granulated sugar. Combine the apple-lemon-herb liquid and sugar in a wide pot and bring to a boil. Boil rapidly for 5-6 minutes (or longer, not to worry) until the gel point is reached (when a drop placed on a cold saucer doesn’t run and wrinkles when touched). Spoon the jelly into prepared jars. If you are planning on inserting herbs, let the jars cool for 5 minutes so that the jelly becomes stiff enough to suspend them. Dunk the herbs in boiling water before inserting in the jars. And make sure that they are not trapping air at the edges. Cap with sterilized lids and place in water bath canner. Cook at a rolling boil for 10 minutes, then turn off heat, remove cover and let stand for 5 minutes until removing the jars to cool completely before storing.